AMD might be taking on the task of manufacturing its own chipsets again, starting with the X570 chipset set to launch alongside 3rd Gen Ryzen. Little tidbits from board manufacturers and system integrators over at CES would have us believe that AMD will be ditching previous chipset incumbent ASMedia and will instead opt to design and build its own PCH. 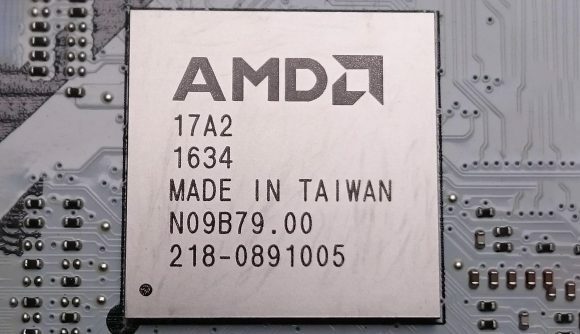 For the last two generations of AM4 motherboards, led by the X370 and X470 chipsets, AMD has relied on ASMedia, a Taiwanese tech company, to produce the motherboard PCH. You may well be familiar with it, the same company is responsible for USB 3.1 controllers for a whole bunch of motherboards when native support was lacking. But that could be coming to an end with X570, which is more or less a return to the natural order of things. AMD incorporated ATI back in 2006, specialists in not just graphics processing units but chipsets, too. The ATI name died that day, but its expertise now lives within AMD’s large corporate umbrella. AMD is reportedly set to return to its in-house expertise for chipset production after its brief stint with ASMedia on chipset duty. Although that could have some impact on power consumption for AM4 chipsets. Speaking to Gamers Nexus, insider sources claim AMD X570 chipset may run at 15W, a notable increase in power consumption over the 6-8W thirst of past AM4 chipsets. The X570 chipset is expected to bring PCIe 4.0 support in some capacity for the first time in the consumer space. AMD has been touting the move to the next generation PCIe standard for some time, but the next generation of professional GPUs and consumer CPUs have already been confirmed with PCIe 4.0 support. This tech will double the bandwidth of the previous standard. And there’s even a chance it will work on older 300- and 400-series motherboards, too. The sources also believe that AMD will be prepping the B550 chipset for launch one quarter after the X570. We expect the red team to launch 3rd Gen Ryzen at Computex, 2019, running from the end of May to the start of June, and we can only assume the X570 chipset will launch right alongside them – potentially corroborating leaked slides from last year.